Day two of my China experience and woohoo I’m still alive. Haha. You guys can’t imagine how crazy people over here drive. Taking over on the wrong side? - No problem at all. Crossing a red light? - Not a big deal. And I’m not only talking about motorists- pedestrians are the same. So on the first day here, when my friend Ines picked me up from the train station by motor bike I got an impressive view of how traffic in Beijing works. Speaking of traffic I also arrived at one of the high pollution days. 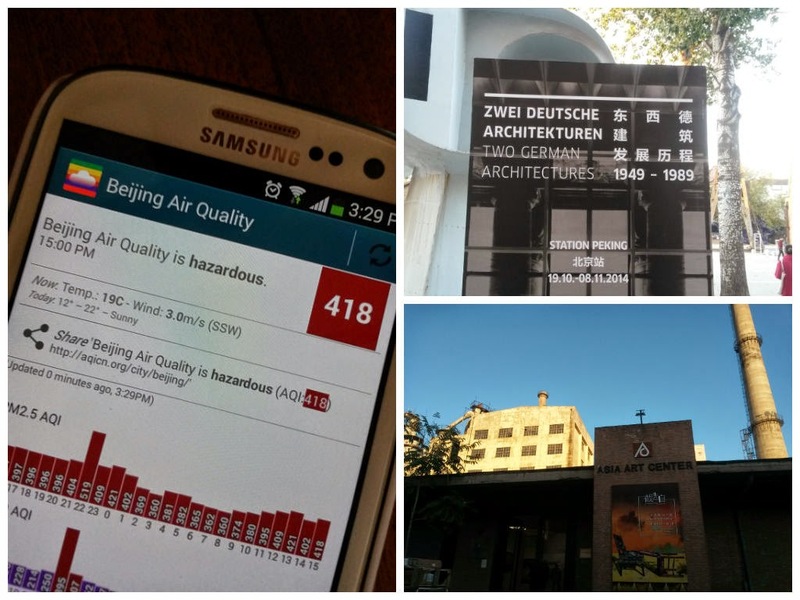 The pollution app on my friend’s phone showed 418 and the lovely warning ‘Beijing air quality is hazardous’ the day I arrived. Just to make it clear, this means pollution was more than 16 times what the World Health Organization considers a safe limit. However, the weather god seems to like me, because the following day all the pollution was gone and the sun was out all day. Me and my friend had a stroll through Dashanzi, the art district of Beijing, where the Goethe Institute is currently showing a very interesting exhibition about architecture and housing construction in East and West Germany after 1949. Somehow weird though to see such exhibition in China. I also managed to buy a sim card for my phone and was super excited to share all the moments on Instagram. I was aware, that facebook & twitter are blocked in China, so I linked both to Instagram and thought I would be fine, but not a bit of it! The government is also blocking Instagram up here since a couple of weeks. Means only rare social media sharing within the next month, but I'll try to update this blog as frequent as possible.